Why I Loved It: If this was literally just a two track album I’d still be raving about it. That’s how much I enjoyed “Who Can it Be Now” and “Down Under” in the early 80s. They are two of the most pleasingly dumb songs that have ever been written as far as I’m concerned. I’m unapologetic over how much I like “stupid’ 80’s songs and when questioned I’ll refer to Men at Work every time as evidence that the 80’s was so cheesy and wonderful. “Who Can It Be Now” came in at No. 24 on my Favorite 100 Songs of the 80’s countdown earlier this year. “Be Good Johnny” and to a lesser extent “I Can See It in Your Eyes” and “Down by the Sea” are fun as can be new wave pop tunes that didn’t garner much attention. 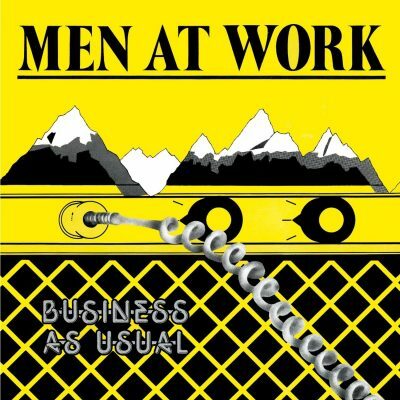 People don’t talk about Men at Work being a staple of the 80’s and rightfully so because they didn’t stick around the mainstream long, but this album was one of the decade’s very finest. Commercial Success: On a commercial level this was one of the most successful debut albums not just of the 80s, but all-time. Between 1982-83 the album went on to spend a staggering 15 weeks at number-one on the Billboard Top 200 and finished 1983 second on the year-end albums chart. “Who Can It Be Now” reached number-one on the Billboard Hot 100 to end a four-week run by John Cougar’s “Jack & Dianne.” Lightning struck twice as “Down Under” also went to number-one on the Billboard Hot 100, spending three weeks at the top and finishing 1983 fourth on the year-end Billboard charts. “Be Good Johnny” didn’t chart on the Billboard Hot 100 but that’s because it wasn’t released as a single in the United States. In total Business as Usual sold more than six million copies in the United States. Oh, Men at Work won the 1983 Grammy for Best New Artist.